Article written in 1999 (many issues still current in 2008). The other day I was about to address an executive conference on the future. Minutes before starting in the seminar room, I heard a voice and looked at the huge screen behind me. I could see someone talking. "I'm Mark from Durban in South Africa," he replied. 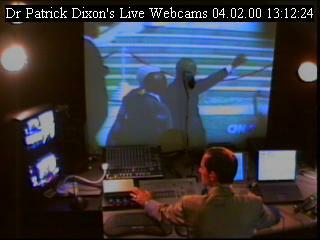 "I'm Patrick Dixon - in Zurich about to give a lecture on the future." "How interesting. I was just dropping by to see what was going on"
By now, ten or fifteen in his office were crowding round, filling a corner of my screen. I invited them to "sit at the back" and join in, clicked their window closed, left the videolink running, and started the presentation. After half an hour, I introduced unsuspecting participants to the Durban guests. They had just as much right to be there as any other members of the public in a hotel lobby who had poked their noses round the door of a conference room in a coffee break. It was a taste of virtual life. But that event took place in 1998. The trouble with videoconferencing is that most people who have tried it still don't like it. Their equipment is often in the wrong place, in a room with no windows and poor ventilation, away from normal office life. They feel the person is not looking at them - no eye to eye contact. The picture is small. The sound / video is delayed which makes normal conversation awkward. And when it comes to formal videoconference presentations, lets face it, most people are incompetent. If you look good on CNN, you will look great on a videoconference as a presenter. Otherwise take real care or don't bother. You will bore the audience to sleep. The best people to use in video-presentations are people on TV all the time - the real pros. Creating a sense of involvement, personal contact, of breathing the same air is a rare but vital skill for long distance presentations to large audiences. 80% or more of the energy of a presenter's personality can be lost in the transmission. How much was there in the room to start with? Interactivity is vital. Eye to eye contact can be achieved by the simple rule: always look at the CAMERA when speaking and the SCREEN when listening. Alternatively, using a projection system, a camera can be placed in the middle of a videowall so that when you are looking at the other person, you are staring directly into the camera. The next step is to stream full multimedia down the line. My own setup has 4 cameras, 7 channel video mixer, two PCs, video, 6 channel sound mixer to create a full live interactive multimedia event for audiences of 10 - 10,000. That means I can mix an image of myself speaking into a corner of a multimedia powerpoint presentation, or make the presentation full screen, or make the talking head full screen, or mix other camera angles. Ten way videoconferencing works well, with a grid of 3x3 pictures of nine participants or groups in nine different countries and a monitor image to check your own output. Just raise a hand to indicate you want to speak so others can give way. Ever tried a ten way phone conference? It's a nightmare. Videoconferencing is a practical solution for virtual board meetings and team discussions. In fact it's the only solution for distance co-operation, with shared documents on screen and other features. that's a really cool trviia thanks a lot! i like online conferences since i believe that it is really convenient and basically free (especially when you use skype). but with such information, i hope there would be more people considering such things.